Verso will be at the London Book Fair from 19th to 21st April 2010. Find our books at stand N605, or download our new foreign rights catalogue here. NOTE: Owing to the disruption to air travel caused by the volcano in Iceland, Rowan Wilson, Sales and Marketing Director, will not be at the fair. Jacob Taubes’ The Political Theology of Paul. The latest issue of the London Review of Books with pieces by Tariq Ali, Frank Kermode and an interview with Tony Judt. Endnotes (now available online!) – discussions between Gilles Dauvé and Théorie Communiste. The latest issue of serious music magazine Loops, with pieces by Mark Fisher and Owen Hatherley. The latest issue of the irregular dubstep and grime magazine Woofah. And for fiction: David Peace’s Occupied City, J.M. Coetzee’s The Lives of Animals and Kim Stanley Robinson’s Red Mars. Verso UK now has an active Facebook page. Become a fan here and keep up to date with all events, reviews, new books and offers. Verso USA’s Facebook page is here and Verso USA’s Twitter feed is here. The unofficial Verso Facebook group can be found here. 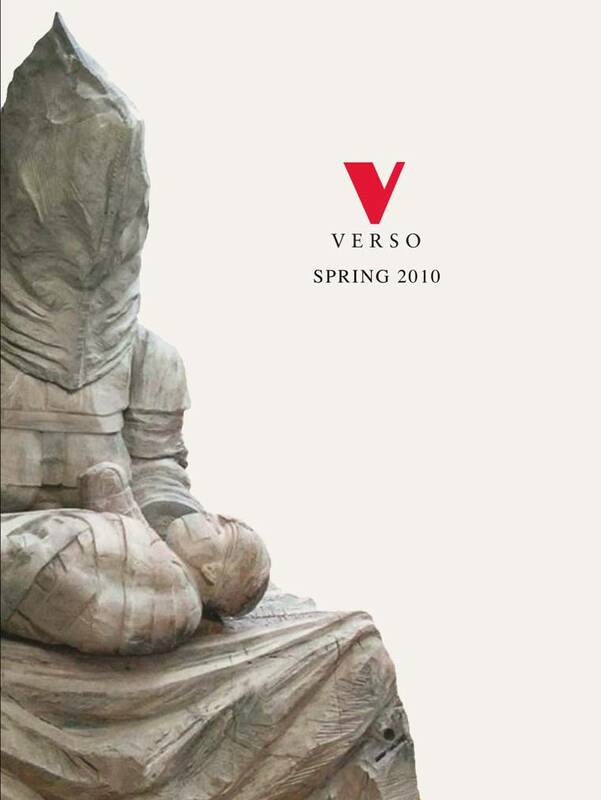 Verso Spring 2010 catalogue – OUT NOW! Our new catalogue of titles for April to August 2010 is on our website now. You can see it here or download the pdf here. The final novel in Tariq Ali’s Islam Quintet, Night of the Golden Butterfly. Alain Badiou’s The Communist Hypothesis. Classic novels by John Berger. The Verso World History series – new editions of groundbreaking works of history. A collection of key texts by Peter Gowan, A Calculus of Power. Fredric Jameson’s book, The Hegel Variations, on Hegel’s Phenomenology of the Spirit. Gideon Levy on The Punishment of Gaza. New editions of Marx’s Political Writings. Human rights lawyer Gareth Pierce On Torture and the Death of Justice. Joshua Phillips on torture practices in the US army: None of Us Were Like This Before. Heather Rogers on the failures of environmental politics: Green Gone Wrong. Jose Saramago’s observations on politics and society The Notebook. Biography of Ernest Gellner and autobiography of Rossana Rossanda. Sheila Rowbotham’s history of the early days of the feminist movement, Dreamers of a New Day. Erik Olin Wright on Envisioining Real Utopias. Slavoj Zizek’s brand new book Living in the End Times, about the forthcoming apocalypse. Incidentally, the catalogue cover image is by superb sculptor Michael Sandle. If you’re thinking about buying someone a gift this winter, check our handy list of suggestions. No matter what the interest, there is something for everyone. Radical Thinkers set 4. The entire 12 volume set of the latest beautifully designed Radical Thinkers, inluding Jean Baudrillard, Louis Althusser, Walter Benjamin, Theodor Adorno, Terry Eagleton, Simon Critichley and Fredric Jameson. On Amazon here. Essential Zizek set. Four classic books by Slavoj Zizek – together making up an essential guide to his thought. Or if you want stocking fillers, try First as Tragedy, Then as Farce or the new in paperback of In Defense of Lost Causes. Valences of the Dialectic – Fredric Jameson. It’s arrived – the massive study of the dialectic by the leading cultural theorist. Pocket Pantheon – Alain Badiou. Another beautifully designed book – Badiou creates his own Pantheon of the great thinkers. Atheism in Christianity – Ernst Bloch. A provocative analysis of the Bible by the utopian Marxist. Frames of War: When is Life Grievable? – Judith Butler. A philosophical exploration of how we exclude the lives of some people from consideration in times of war. The Emancipated Spectator – Jacques Ranciere. The long awaited new book on the politics of art by the leading philosopher. The Wire Primers: A Guide to Modern Music. The Wire magazine’s introduction to the best music of John Cage to dubstep, Sonic Youth to James Brown, noise to Grime. An Orchestra Beyond Borders: Voices of the West-Eastern Divan Orchestra – Elena Cheah. Vivid accounts of playing in Daniel Barenboim’s orchestra and of the conflicts of the Israelis and Arabs who play in it. The Invention of the Jewish People – Shlomo Sand. The book that everyone’s talking about. Shlomo Sand shows how the Jewish people were a 19th century invention. Eric Hobsbawm and Simon Schama’s book of the year. The Devil and Mr Casement: One Man’s Struggle for Human Rights in South America’s Heart of Darkness – Jordan Goodman. A gripping history of how Roger Casement uncovered atrocities in Peru. The People’s History of the World – Chris Harman. Acclaimed by Howard Zinn, this best seller is the only ‘bottom up’ history of the entire planet. Adam Smith in Beijing: Lineages of the 21st Century – Giovanni Arrighi. The elegant exploration of China’s evolution as the most dynamic economic power house. The Economics of Global Turbulence – Bob Brenner. A tour de force analysis of the world economy from 1950 to the present day. Essential reading. Meltdown: The End of the Age of Greed – Paul Mason. The BBC Newsnight presenter’s fast-paced account of the financial crash. The Prophet – Isaac Deutscher. The classic biography of Trotsky, now available as a discounted 3 volume set. Despite recent contenders, it remains undefeated! Edward Carpenter: A Life of Liberty and Love – Sheila Rowbotham. Now available in paperback the acclaimed biography of the pioneering Victorian radical. Ernest Mandel: A Rebel’s Dream Deferred – Jan Willem Stutje. The only biography of the leading revolutionary thinker of late capitalism. Che: A Graphic Biography – Spain Rodriguez. The best selling story of Che’s radicalisation, his revolutionary years and his murder. From A to X: A Story in Letters – John Berger. The acclaimed novelist and critic with his Booker longlisted novel of struggle and love. Manituana – Wu Ming. The authors formerly known as Luther Blisset (who wrote Q) return with their well-reviewed historical novel about the American War of Independence. Field of Honour – Max Aub. Translated in to English for the first time, this is a classic novel about the build up to the Spanish Civil War. The Curious Enlightenment of Professor Caritat – Steven Lukes. The classic fictional guide to political philosophy. The Protocols of the Elders of Sodom And Other Essays – Tariq Ali. The writer, film maker and activist’s provocative writings on literature. The Task of the Critic: Terry Eagleton in Dialogue. Matthew Beaumont interviews Terry Eagleton about his life and work in a series of characteristically witty exchanges. Filming Pancho: How Hollywood Shaped the Mexican Revolution – Margarita de Orellana. On the centenary of the Mexican Revolution, this examination of the filming of the struggle offers thrilling new perspectives. A Short History of Cahiers du Cinema – Emilie Bickerton. A fascinating critical history of the most influential film journal in the history of cinema. The New Old World – Perry Anderson. Just released now, the long-awaited analysis of Europe by the leading writer and thinker. Saviors and Survivors: Darfur, Politics and the War on Terror – Mahmood Mamdani. The controversial analysis of the call for humanitarian intervention in Darfur. After the Party: Corruption, the ANC and South Africa’s Uncertain Future – Andrew Feinstein. The former ANC MP shows how the party has become tainted by corruption. Israel and Palestine: Reappraisals, Revisions, Refutations – Avi Shlaim. The essays of the acclaimed scholar and historian which show his passionate critique of the politics of the Israeli state. A Child in Palestine – Naji Al Ali. A collection of the work of the legendary Palestinian cartoonist, with a foreword by Joe Sacco. Mural – Mahmoud Darwish. Extraordinary poems by the Palestinian poet, illustrated by John Berger.